I came across a recipe a few weeks back on a relatively new (to me) blog, that instantly took me down memory lane. Memories of the countless summer vacations spent in Kerala came flooding back. Summer was the season when mangoes were aplenty everywhere and it was no different at our ancestral home. The best part of the Kerala trip for me was undoubtedly the food, especially at my father’s illam. Among other things, I remember eating mangoes, lots of it. 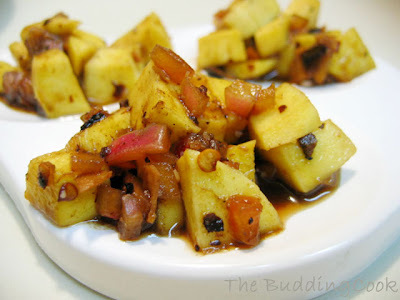 A common preparation that was a hit with all the kids there at the time was chopped mangoes slathered with a coarse paste made of crushed shallots, roasted red chillies, coconut oil and salt. It was absolutely heavenly! That has got to be the fondest food memory from my childhood, and this recipe took me there. The original recipe can be found here. With clean hands crush the chopped onions, salt, red chillies and pappadams thereby mixing everything very well. Dissolve the brown sugar in the tamarind extract and add to the crushed mixture. Stir in the coconut oil. Serve with some hot rice, or do what I did and have it with some chopped mangoes. Thank you so much for sharing your recipe, Rajani! This goes to Sig for JFI: Tamarind. Here's how I like to have to have puli pottichhathu- with chopped mango pieces. 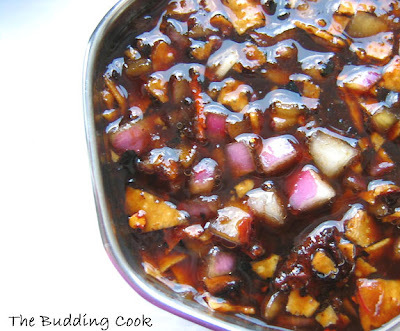 wow this chutney looks awesome.. This took me down the memory lane too... BTW did I read that right - you actually had this with mangoes "instead of" rice? :) Sour over sour, you are my kinda gal! :) Thank you for this entry TBC! I've never seen this before! Quite an interesting tamarind preparation. We make something somewhat like this - the papads are new to me. Nothing is cooked in that dish. OMG...the dish, and the picture and your description most of all has me drooling! oh my! !that looks delish. we used to have chennacha papayas like that. drool drool...just reading the title brings that tangy taste to my mouth!! looks delicious, TBC! mmm. delicious chutney! looks so colorful.nice entry. You just took me down memory lane to the times when I had mango and the spicey mixture that you are talking about...Those were the times...I'm disappointed my daughter is missing out on all that!!! Wow, that picture really had my tastebuds going! What a wonderfully evocative blend of flavors, TBC. And mangoes with crushed shallots and chillies sounds beyond delicious. Outstanding! A must try. Thanks for posting this. This is new to me also. None of my Malayali frnds. have ever brought this to office! Pappadams in tamarind is a novel idea - Should taste good with rotis also! ooh! does that look groovy or what ;) slurrrrp! This is definitely one to try! What a great find - the new blog. I have not yet used tamarind as a main ingredient in a dish. Just used it to add that great sourness to other dishes. I will have to try this soon. I had THIS with mangoes, and then I had my usual quota of rice with something else.:D. Sra- I added papads only 'cos Rajani added them. :D I guess it's done to impart a roasted flavor to the prepearation. I can see why u like it so much! Swati- Since that includes my dish, I'd say u have great taste! ;-). BTW, I had no idea u were a South Indian! JZ- I am so glad I came across Rajani's blog. She has some great dishes there! Do give it a shot...you'll like it.